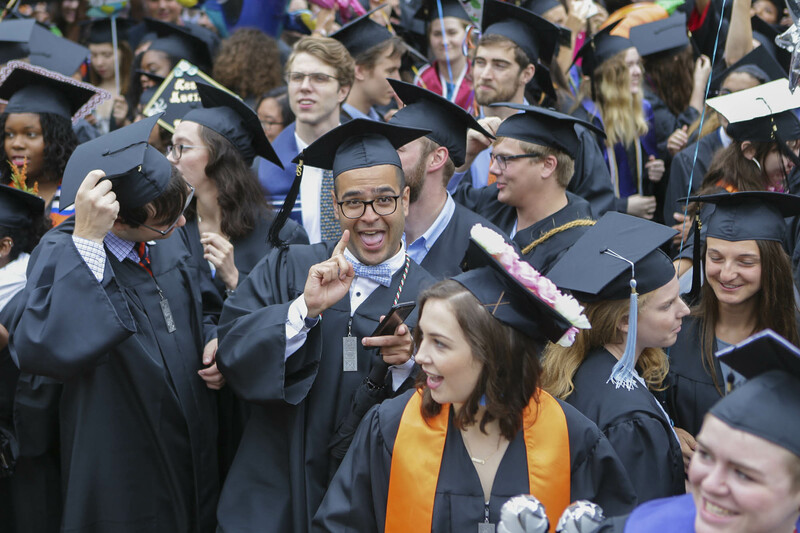 Despite the rain, a joyful procession of University of Virginia graduates streamed over the marble steps of the Rotunda Saturday morning, buoyed by the cheers of poncho-clad family and friends gathered on the Lawn to celebrate the University’s 189th Final Exercises. 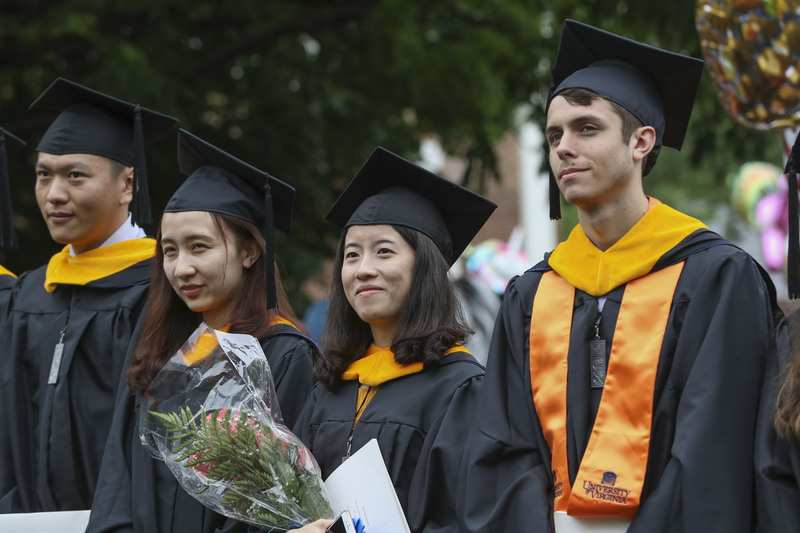 Saturday’s ceremony honored graduates of the College and Graduate School of Arts & Sciences, the largest of UVA’s 11 schools. Students in the University’s 10 other schools and the Data Science Institute will receive their degrees in a second ceremony on Sunday. 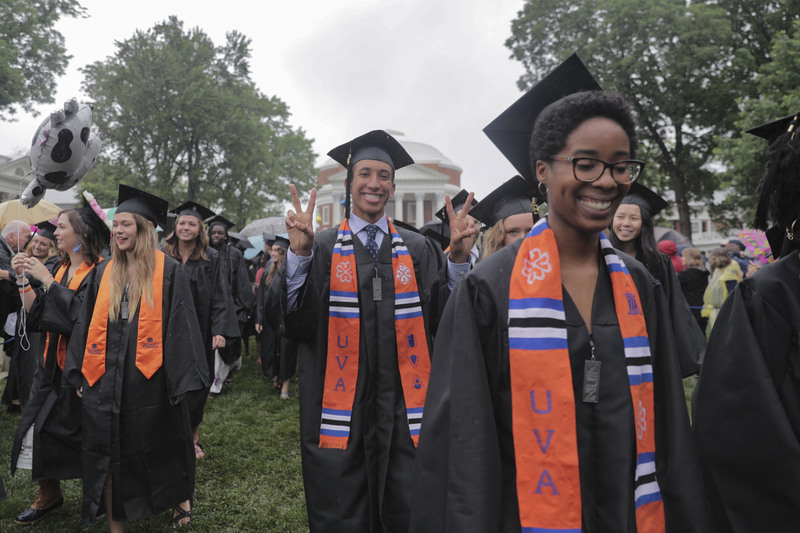 UVA awarded 3,113 degrees to Arts & Sciences students on Saturday. In total, the University will confer 7,072 degrees, including 4,238 baccalaureate degrees, 2,377 graduate degrees and 457 first professional degrees. Of those graduating with baccalaureate degrees, 103 earned their degrees in three years and five did so in two years. More than 400 of the graduates are the first in their families to earn a college degree. The Lawn began to fill early Saturday morning, as parents like Anna and Roger Brown and their son Justin streamed in to claim their seats. Umbrellas in hand, the Fredericksburg family awaited their graduate, Ramsey Brown, a biology major in the College. “We are very excited,” Anna Brown said. Another family, the van der Voorts, said they were having a great day despite the drizzle. Elizabeth and Rachel van der Voort, grandmother and aunt, respectively, to graduate Arrietta van der Voort, were eager to see her process in. Arrietta, who studied art history and photography, will be moving to Los Angeles to pursue a career in the arts. “We are looking forward to having someone to visit out there,” grandmother Elizabeth van der Voort said. As the graduates took their seats, the crowd turned its attention to the blue-and-orange-covered stage in front of Old Cabell Hall. UVA President Teresa A. Sullivan, who is stepping down in July, presided over the ceremony and gave the commencement address, as is traditional for outgoing University presidents. Sullivan will also address graduates on Sunday. Sullivan, UVA’s eighth president and the first woman in the role, has led UVA for eight years. In that time, she has championed programs that limit student debt and enhance financial aid, developed a comprehensive plan addressing generational turnover among faculty members and overseen the establishment of a Strategic Investment Fund that provides significant support for scholarships, research, academic initiatives and health care services without using tuition dollars. Sullivan also oversaw the restoration of UVA’s iconic Rotunda and the launch of the bicentennial commemoration last fall, and created two commissions reexamining the University’s past and its role in race relations: the President’s Commission on Slavery and the University and the President’s Commission on the University in the Age of Segregation. After taking a moment to look out over the sea of graduates, the president began her remarks with a story that took place far from UVA – about British explorer Sir Ernest Shackleton’s famous expedition in Antarctica. Shackleton and his men survived a shipwreck, spent months camping on the ice and finally survived by navigating their lifeboats to an inhabited island. Shackleton’s crew displayed extraordinary resilience, Sullivan said. It’s a trait, she told the graduates, they will need in spades throughout their postgraduate lives. 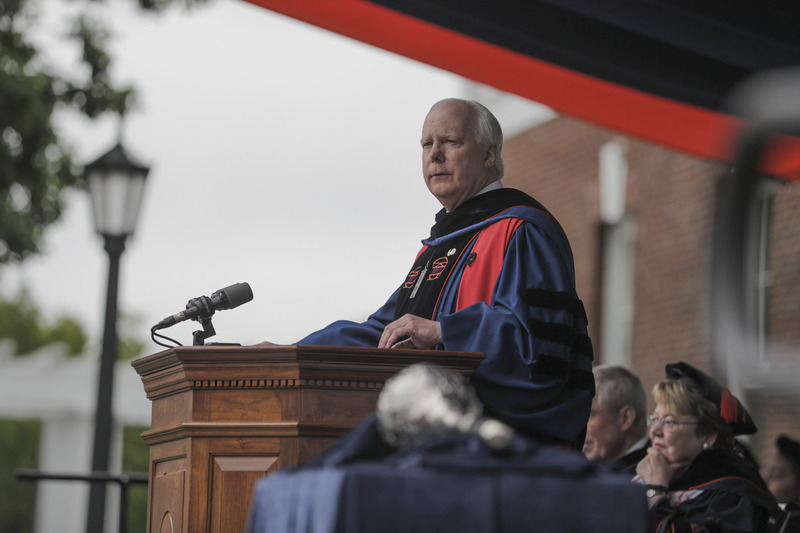 Sullivan noted that the Class of 2018 had already displayed exceptional resilience throughout its time at UVA. This year’s class persevered through a number of challenging, tragic situations, ranging from the disappearance and death of then-second-year student Hannah Graham during their first year in 2014 to the white supremacist attacks on Grounds at the start of their fourth year. More than that, Sullivan said, she expects “spectacular” things from this class. “We expect you to solve the difficult problems that have confounded us in our time; to find the disease cures that have eluded us; to develop solutions to wicked environmental problems; to seek reason and cooperation in our nation’s public discourse, without stifling dissent and disagreement; to seek justice without forgetting mercy,” she said. Before they marched into that future, however, the graduates had one more collective task as UVA students: a rendition of the “Good Ol’ Song.” It was as loud and as joyful a chorus as any heard on the Lawn.